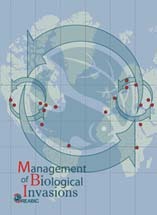 Management of Biological Invasions is an open access, peer-reviewed international journal focusing on applied research on alien species and biological invasions in aquatic and terrestrial ecosystems from around the world. Management of Biological Invasions is devoted to bridging the gap between scientific research and the use of science in decision-making, regulation and management in the area of introduction of invasive species and biodiversity conservation. Management of Biological Invasions is an official journal of International Association for Open Knowledge on Invasive Alien Species (INVASIVESNET). 2017 Journal Impact Factor: 2.037 (the Thomson Reuters Journal Citation Reports).